TIGER EYE HAIR was designed around a barber shop concept, meaning; back in “the good ole days” the place where you got your hair done was something you were proud to visit. The barber shop had community, it was friendly, and the people knew you by first name. It was your escape from reality and when you left, you felt great on the inside and looked even better on the outside. You left saying good bye not just to the individual who did your hair but to the whole shop. While designing the barber shop it was important to us that it had a classic feel. 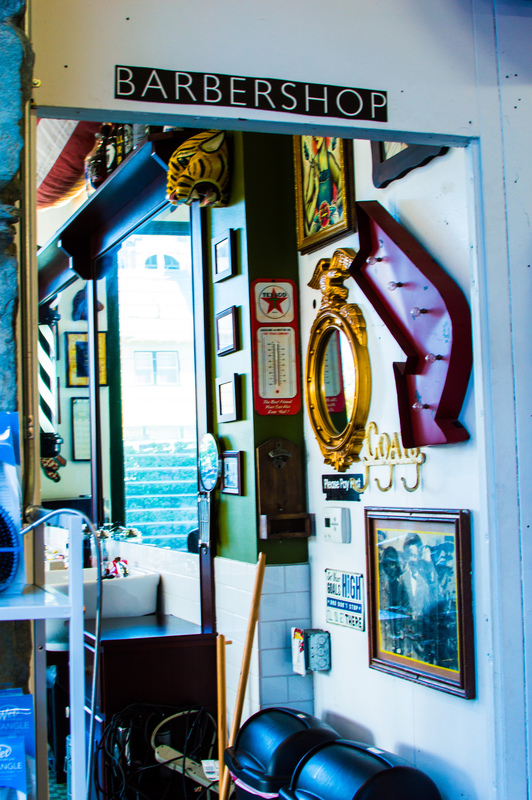 We wanted the customer to feel like they had taken a step back in time and found themselves in a classic old barbershop. With a combination of the original 60’s Texaco checkered floor, custom cabinetry, crisp white tile, a glass front fridge filled with ice cool suds, classic comfortable barber chairs, historical pictures and barbering artifacts it will give you the feeling that after a crisp cut and a straight razor shave you and your buddies will be headed to an after hours joint to sip bourbon and buff stogies. HERES THE CATCH, all we ask is for you to put down your phone, computer, iPad, magazine, iPod, book, etc. and converse with people in the shop. Get to know one another because here at Tiger Eye barbershop we are one big construction working, lawyer fighting, doctor saving, dish washing, car detailing, landscaping, fry cooking, fire fighting, graphic designing, motorcycle riding, football watching kind of shop dedicated to keeping the art of barbering alive. We are the future! We are TIGER EYE BARBERSHOP here to serve you, family, friends, the conservative, the creative, the weird, the mature, the immature, and the wild. HECK EVERYONE IS WELCOME!